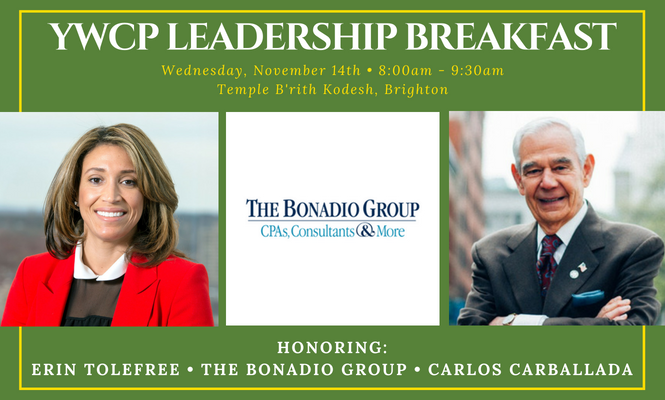 Reserve your table today for the 8th Annual YWCP Leadership Breakfast, which will be held on Wednesday, November 14th at Temple B’rith Kodesh in Brighton. This year’s event will celebrate the life-changing power of education by honoring our recent graduates, our students, and three amazing honorees who have contributed greatly to educational opportunities for women and girls in our community. To learn more about this year’s Leadership Award Honorees, click here. Your support at the YWCP Leadership Breakfast helps to provide college readiness programs for the students of Young Women’s College Prep Charter School. Please consider hosting a table this year and inviting your friends, family and co-workers, so they can hear the inspiring stories of success from the students (and alumni!) of Young Women’s College Prep Charter School. Sponsorship opportunities are available. Click here for details. We kindly request that payment for Table Hosts be made by August 31st in order for your name to be included on the formal invitation. Thank you for your support!